The iconic pulse-pounding clock resets when 24: LIVE ANOTHER DAY premieres with a special two-hour television event Monday, May 5 (8:00-10:00 PM ET/PT), and makes its time period premiere the following week on Monday, May 12 (9:00-10:00 PM ET/PT). The high-octane saga reunites the Emmy Award-winning team of executive producer Howard Gordon; star and executive producer Kiefer Sutherland; co-creator Robert Cochran; executive producers Evan Katz, Manny Coto, David Fury and Brian Grazer; and executive producer and director Jon Cassar. 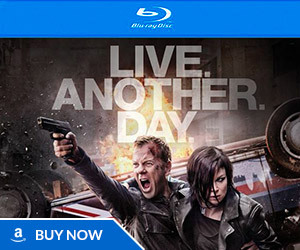 Set and shot in London, the suspenseful event series once again will follow the exploits of heroic agent JACK BAUER (Sutherland), as he attempts to thwart an unthinkable terrorist attack that could change the world forever. Retaining the real-time, nail-biting, fast-paced format with split screens and interweaving storylines, the highly-anticipated series also stars Mary Lynn Rajskub (“Firewall”), Kim Raver (“Revolution”) and William Devane (“The Dark Knight Rises”) reprising their original roles. Newcomers to the drama series include Yvonne Strahovski (“Dexter”), Giles Matthey (“Jobs”), Gbenga Akinnagbe (“The Wire”), Michael Wincott (“The Crow”) and Academy Award nominee and Golden Globe Award winner Judy Davis (“Life with Judy Garland”). Oh my god! I can’t waitttt! Is this a good time slot (to those in the USA? )… unsure of the prime time slots as I’m from Ireland. when will “Live another day” be shown in the UK PLEASE!!!!! @Patricia – most likely a week after on Sky 1 – expect an announcement from Sky soon. It was said though that broadcasters were going to be different and they didn’t retain any of the rights. But Sky is the ‘home’ of ’24’ in the UK. The likes of the BBC wouldn’t want to be seen paying megabucks for a TV series at the expense of the license payers. Maybe Channel 4, maybe ITV – but I just don’t see it. Omg, I can’t wait as I am a huge fan of 24 and this news makes it even official that the best drama is coming back and its like 24 has never ended. I am so excited again to see Jack Bauer in action along with Chloe and Audrey. anyone know when it will premiere on Sky1 in the uk? @Jack: Monday nights at 9:00PM EST was always the regular time slot for “24” in the United States, so it’ll be just like old times! OMG !!! OMG !!!! what I can say else !!!!!!!!!!!! So is Tony Almeida comming back? @Jack I’m from Ireland too hopefully it will be on TV3 or something like that. Dont fvck it up this time cheesey directors. Lets not pretend Jack is gonna get shot or die. Jack doesnt die so dont do something like last time when the guy has Jack in his scope and at the last second someone shoots him. We know jack isnt getting killed. And unfortunately for Keifer, all we wanna see is Jack running around killing people. A little white house, a little CTU then back to Jack! Let Jack be Jack. Enough with rogue Jack and everyone wants him arrested. Its annoying. Stick to gritty not cheesy. So – is it going to be a full 24 hour season? I had read awhile back that it’s going likely be only 13 hours. I’ve just realized that with this release date they’ll have aired 5 episode before the end of May which probably means they’ll be up for emmy consideration just that summer!!! Whilst everything we’ve heard today is both thoroughly encouraging and genuinely exciting, the only downside is the potential hints from Kiefer that ’24’ could continue with a new character in the lead… possibly the new Kate Morgan character! I cannot stress just what a FOOLISH idea that would be should they try it, learn the lesson from ‘The X Files’ in it’s (pointless and unnecessary) ninth and final season, whereby they tried to put the characters played by Robert Patrick and Annabeth Gish upfront to continue the series post-Mulder and Scully… they lost 30% of the audience in the first episode and the rest of that season went into a ratings tailspin, with it’s ultimate cancellation announced about half-way through the season! 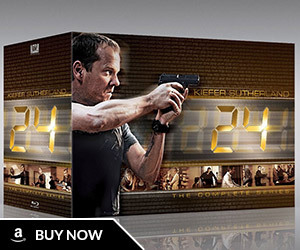 Whether Kiefer is humble enough to admit it or not, the fact is that Jack Bauer is not a mere part of ’24’… he IS ’24’ and when the time comes for Jack to hang up his man-bag, the ’24’ saga as a whole should do likewise! I wouldn’t worry about Jack being replaced, Gerry. Kiefer has been saying similar things from the very start of the series (how the star of the show is the real-time format and not him). He’s just being humble. FOX certainly realizes Kiefer is crucial to the franchise, that’s why he was the highest paid actor on TV for the last couple of seasons. 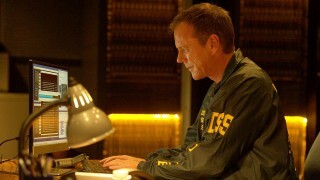 I can’t imagine them doing anything without Kiefer/Jack. So very excited!! Can hardly contain myself. Want to tell everyone the news. So very glad to hear ’24’ is returning!!! Been hoping and waiting since it ended. I knew that it would eventually return since I heard the announcement made on ‘The Five’ on Fox News Channel by Bob Beckel. 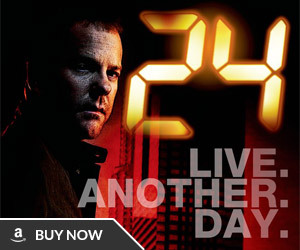 Confirmed: ’24: Live Another Day’ coming to Sky 1 HD in the UK in May… also available from February is Season 1. And after that, they’re selling Days 2-8 as a ‘box set’ I believe. Good that it’s getting some coverage from the BBC as well. YESSS!! JACK IS BACK! SO LOOKING FORWARD TO IT!! love love love 24 and jack! Way to go Fox for bringing jack back! I can’t wait to watch. While I love Kiefer Sutherland as an actor, I think it would be great if there was less focus on him. Putting him at the centre of every single ordeal really dehumanises his character and it’s kind of getting silly by now. The problem the show has is that there aren’t enough decent other characters. If they introduced a proper selection of other human characters instead of the cookie-cutter formula they have every season (and from the looks of the casting announcements, have repeated again this year). Take a look at The Wire for an example of an ensemble of interesting characters that was able to change the focus across seasons.